Spoiler: No, XBT is not different from BTC. These two symbols are used synonymously to refer to ‘Bitcoin’. But I think only knowing the spoiler information is not enough, and it is my duty on CoinSutra to tell you everything important surrounding Bitcoin. So right now, we are going to talk about Bitcoin’s ticker symbol – i.e. BTC (aka XBT). Why do we need two ticker symbols? To answer this, let’s remember that Bitcoin is not a sovereign currency, meaning it is not a national currency produced by any specific entity. It exists with no single point of origin. One of those challenges is how and what to name it. It’s just like having a type of food that goes by different names in different countries or different communities. This happens because there is no standard procedure for naming. Similarly, Bitcoin, being decentralized, is called by two different abbreviated names (i.e BTC and XBT) because there is no one in charge to set naming standards. But the interesting thing is that even the founder of Bitcoin (Satoshi Nakamoto) didn’t give an abbreviation to Bitcoin. I believe he did this purposely so that the community could have full control over the coin. Also, Satoshi mentioned the word “Bitcoin” only twice in Bitcoin’s white paper. He did this because it’s not the name that matters but rather the overall concept. Why Is It Called BTC? Bitcoin is called BTC because it makes logical sense – the acronym follows the sound of the name. So this has been the prevailing Bitcoin symbol. But now, some have also started using the symbol XBT. Why Is It Called XBT? What?! What does Bhutan have to do with this?! So “BTC” conflicts with Bhutan’s currency which is BTN (Bhutanese Ngultrum). That’s why some use the alternative ticker name “XBT”. Some exchanges use XBT, but not all. Also, most merchants are still referring to Bitcoin as BTC. One of the main reasons for talking about this topic is to brush off the confusion over Bitcoin’s two ticker symbols. Why? Because Bitcoin is bigger than its symbols. Also, some new users in the cryptosphere tend to get confused by XBT and XRP. Ripple is XRP and Bitcoin is XBT. Don’t get confused. Also, don’t get trapped in scams or schemes run by people telling you that XBT and BTC are two different currencies. They’re not. 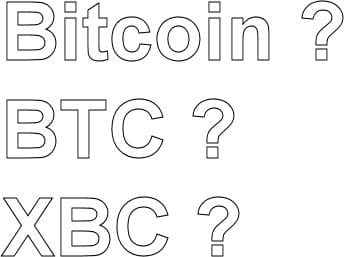 If you ask me which symbol I like best, then I would without a doubt say ‘BTC’ because it naturally sounds more like a short form of ‘Bitcoin’ and also contains all the important syllables. Also, since it goes beyond “traditional” currencies and commodities, I don’t feel it’s important to follow the mold of any international naming standard. BTC sounds better, looks better, and for my taste, is better. So that’s all from my side in this article. I hope that clears up some doubts! Which Bitcoin symbol do you prefer? XBT or BTC? Do you think both are terrible? What would you call the almighty Bitcoin instead? Let me hear your thoughts in the comments below! If BTC & XBT are the same then why is there such a difference in price in Barchart?